Dallas – January 27, 2013— At Alamo (100 S. Central Expressway #14, Richardson, TX 75080) this month, the spirit of Valentine’s Day permeates all February long with a full slate of love-themed movies. http://drafthouse.com/dfw/richardson. "Love is in the air this February at Alamo Drafthouse! When programming February, the theme was obvious: Valentine's Day. But that day, synonymous with chocolate, flowers, greetings cards and stuffed animals the size of VW Beetles, isn’t all of that for everyone; therefore, we programmed the films that we are in love with. This results in films that capture every level of relationships: from falling in love to falling out of love, to being so love-struck that you can't do anything but sing, to full-frustration mode to fight your love’s 7 evil exes to win his or her affections. Basically, no matter what love means to you, we promise that there's a film that will capture your heart—the classics, the sappy, the indie, the comedy, the '80s rock ballad, and more. This February, we hope you choo-choo-choose Alamo Drafthouse as your Valentine!" said James Wallace, creative manager, Alamo DFW. Whether your t-shirt reads: “I Heart Valentine’s Day” or “I Hate Valentine's Day,” chose your own Valentine's Day adventure with THE NOTEBOOK. In one theater, Alamo presents a lovey-dovey showing of THE NOTEBOOK complete with fancy-dancy menu specials for all hoity-toity lovebirds. For all, uh, hatebirds, Alamo presents Master Pancake Theater’s take on THE NOTEBOOK. The movie mockers bring the hammer down, and go-all-Gosling via DRIVE on the romance classic. Both YOU’VE GOT MAIL and CASABLANCA are selections from the “Alamo 100,” a list of essential films chosen by the theater’s programmers. 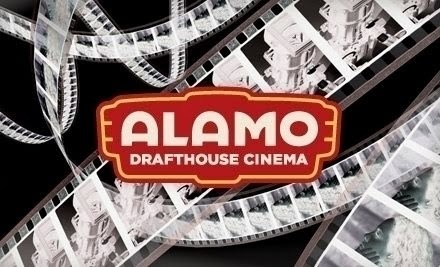 Unveiled in January, “Alamo 100” titles, listed on http://alamo100.com, will be a part of the theater’s nationwide programming throughout 2014. Free collectible button pins themed to each title will be available while supplies last at every Alamo 100 screening. “All in all, if you're in love this February or loving to hate the Love month, you’ll love being at Alamo Drafthouse Richardson as always with all this special programming, we, of course, have our full slate of first-run movies such as MONUMENTS MEN, THE LEGO MOVIE and more!" concluded Wallace. The Alamo Drafthouse is a lifestyle entertainment brand with an acclaimed cinema-eatery, the largest genre film festival in the United Sates and an online collectible art store. Named “the best theater in America” by Entertainment Weekly, the Alamo Drafthouse Cinema has built a reputation as a movie lover’s oasis not only by combining food and drink service with the movie-going experience but also introducing unique programming and high profile, star studded special events. Alamo Drafthouse Cinema‑Richardson, 100 South Central Expressway, #14, Richardson, TX 75080 (972) 534-2120.
hope you guys email and let them know you want it in Dallas too.. CHRISTIAN KANE is DALLAS, TX native!! !